“Annoncer la Couleur” (ALC) is a world citizenship education programme funded by the Belgian government, aiming to emphasise worldwide interdependences in learning, particularly between Northern and Southern countries. World citizenship education aims to prompt changes of behaviour, ways of thinking and seeing (“that young people become responsible citizens: actors, at their own level, in international and critical solidarity when confronted to global development challenges”). ALC offers to people who work with 10-18 year old people original and participative educational approaches to address with their audiences world citizenship issues (migrations, democracy, cooperation ...). Concretely, ALC addresses upper primary school (10-12) and secondary school (12-18) teachers, and other people working in young people training. 	To get informed and understand different sides of cultural realities in order to take them into account during the learning. 	To learn to foster interculturality in one’s practice. The training addresses issues related to migrations and asylum-seekers welcome in a serene atmosphere. What makes people move away? What actions can be taken with young people so that they meet others? The participants are invited to think about those various sides of multicultural realities. 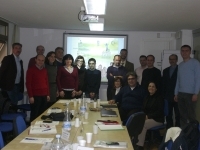 They are led to analyse and synthesised the international mechanisms that provoke migratory flows, to confront the experience of the migrant to their own belonging, to make a stand on issues related to the treatment of migrants at the international level and regarding welcome at the national level, and to show creativity imagining actions and possible commitment at their own level. The training proposes original and participative educational approaches. The participants experiment educational tools that can later be used in class. When the training is over, a series of educational sheets (guide for the approach, activities, points of reference) is given to the participants. The issues addressed during the training relate to the curricula of several school subjects. In particular denominational courses (in Belgium: the various religions or “moral”) during which teachers bring students to understand and act in the world, to make a stand and build their value system, to acquire a critical mind and, ultimately, prepare all students to be open to other cultures. World citizenship education opens people’s eyes on the world realities and commits them to participate in a fairer and more equal world, a world with human rights for all. ALC can organise specific trainings on demand (such as for the Belgian Red Cross) and propose other educational activities: forum theatre, film and debate, exhibition visits, educational meeting ... as well as other educational resources (dossiers, role-playing games, CD-ROM, DVD ...) and support for project creation. The training is recognised by IFC (in-service training centre) of the Fédération Wallonie-Bruxelles.